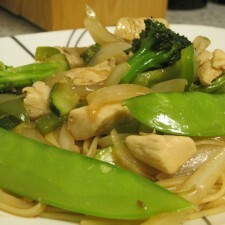 Last night I made chicken stir fry and it was so delicious, plus it was a really quick and easy recipe to follow. I used coconut oil cooking to saute the chicken and veggies and it added an amazing flavor that went perfectly with the stir fry sauce. I know this is one healthy recipe will be added to the rotation. Pete kept saying how good it was and even went back for seconds! That’s how I know he really likes something and isn’t just being nice. I love to use noodles for my stir fry but you can use rice as well. You can even buy the microwave rice to make it that much easier. For the veggies I used onions, green peppers, broccoli, zucchini, and snow peas, but you can use whatever veggies are your favorite or whatever you have on hand. 1. Prepare chicken and vegetables by slicing into small pieces. 2. Cook half of a box of linguini in boiling water until tender. Drain and add a small amount of stir fry sauce so the noodles don’t stick together. 3. Saute chicken in hot wok with coconut oil. Once chicken is almost cooked through add all vegetables and cook about 3-4 minutes. Add as much stir fry sauce as you like. 4. 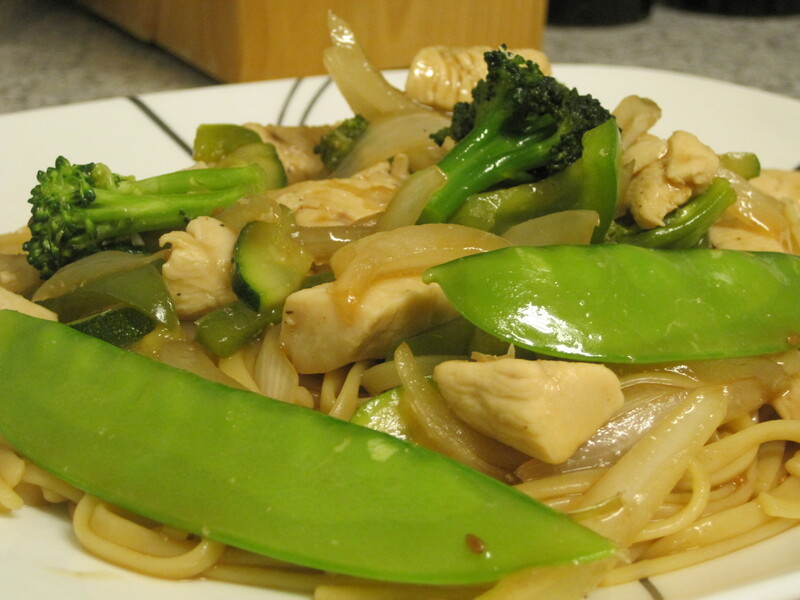 Top prepared pasta with the chicken and veggie stir fry.